I love bibimbap! I crave bibimbap! And now I can make it at home 🙂 Bibimbap is a Korean rice dish that can be served in a sizzling hot bowl. The bowl contains rice, meat, vegetables, and an egg, and it comes with a side of spicy red sauce. Pour the sauce into the bowl, mix everything together, let the rice crisp up, and that’s bibimbap. Believe it or not, I ate a considerable amount of bibimbap when I lived in Paris. In DC, Mandu is my go-to source, and my other favorite place is Oishi in Newtown, PA. The key to making bibimbap at home is procuring the correct spicy sauce. It is called kochuchang, which can be spelled a trillion different ways. Don’t think you can substitute this sauce and end up with the proper result. 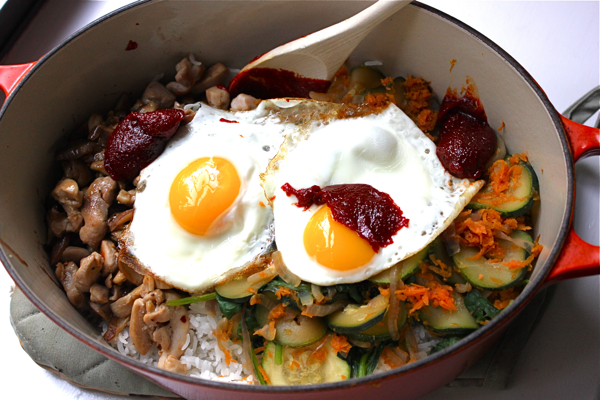 I once tried making bibimbap with sriracha, and it was very…off. You can buy kochuchang at Asian groceries or on Amazon like I did. When buying online, however, pay attention to how much sauce you’re ordering. I failed to do this and ended up with a 6 pound tub of sauce. Restaurant size. I’ll never be able to make enough bibimbap to use this up. Anybody want some? Once you have the right sauce, make your bibimbap! 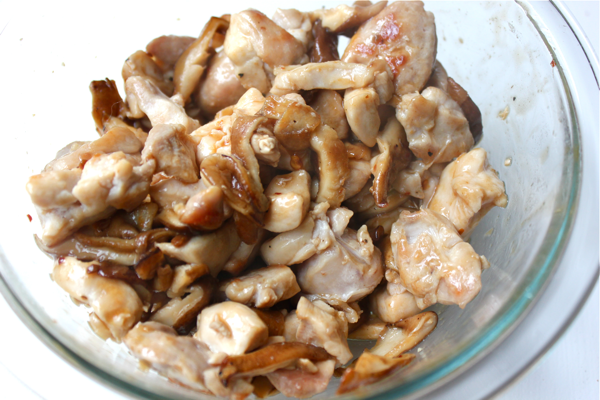 To make 3-4 servings, start by dicing up 3 chicken thighs and a pint of shiitake mushrooms. Add some vegetable oil to a frying pan, and cook them until they are golden brown. Remove the chicken and mushrooms to a side bowl, and pour in a tiny bit of whatever Asian sauce you have around. I used a mixture of teriyaki and soy sauces. Stir so that the chicken is just coated, and set the bowl aside. You can also make bibimbap with shredded beef. While the chicken cooks, prepare your vegetables. Grate 1-2 carrots. Thinly slice a zucchini (a mandoline helps) until you have about 1 cup of slices. 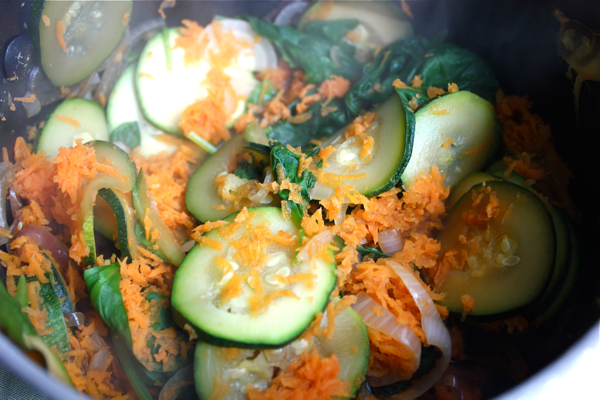 Cook the carrots and zucchini until they are just soft but still crisp and fresh. You can steam them, blanch them, or do whatever else you like. Wilt 1 big handful of baby spinach leaves. I steamed the veggies in a pot with a mixture of water and soy sauce. I added the vegetables according to their cooking time- zucchini first, then the carrots, and last came the spinach. Set the vegetables aside. 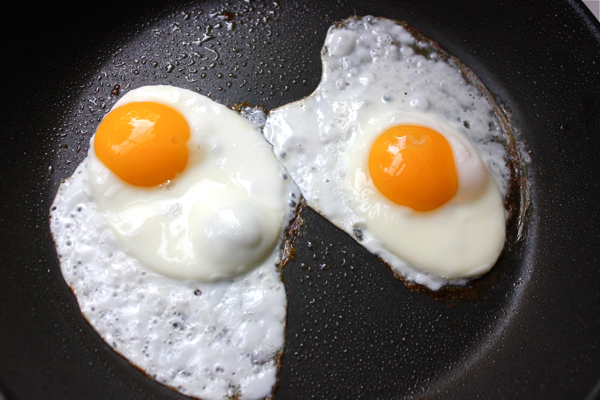 In a frying pan, cook 1 egg per person over-easy. The yolk should be runny so that it seeps into the rice when everything is stirred together. Yummm. Time to assemble the bibimbap. Coat a cast iron pot lightly with vegetable oil, and heat it over high heat. Add in 4 cups of cooked, white rice. Pile your chicken and veggies atop the rice. Place the eggs on as well. Let the pot sit until you can smell the rice starting to toast, and then remove it from the heat. The crispy bits of rice are what make bibimbap so addictive for me. 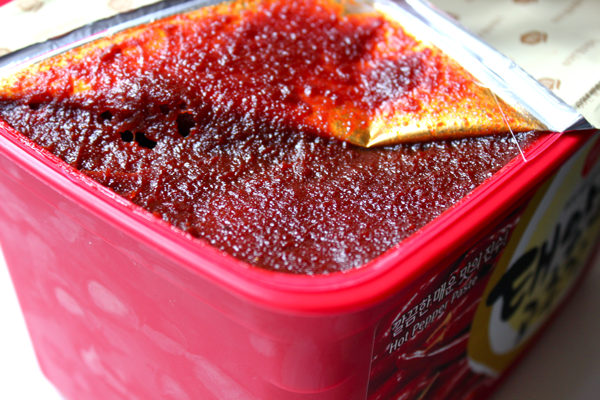 Once the rice toasts, add about 2 tablespoons of the kochuchang sauce into the pot. The sauce is pretty spicy, so some people may like more or less. 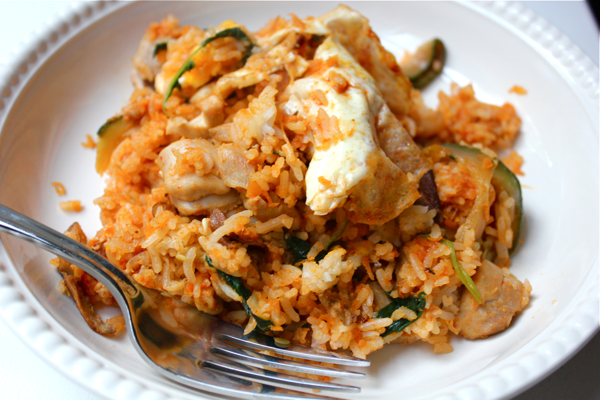 The spice is easier to control when bibimbap is made in individual portions. When you’re making it in a group pot like this, it’s better to under season and let people add more sauce if they want more heat. Stir everything in the pot together really well. Break the egg yolks, mix the rice evenly with the veggies, and get everything coated in the sauce. 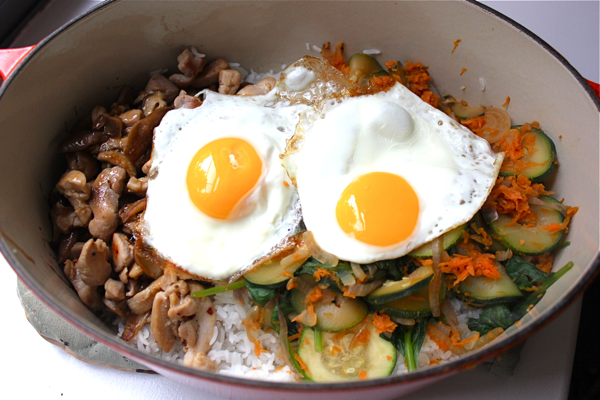 Serve it out into bowls, and enjoy your bibimbap! Bibimbap makes the best leftovers so store your extras in the fridge, assuming that your fridge isn’t completely hogged up by a huge tub of spicy sauce! I have had to make so many changes in my diet giving up wheat and dairy that I am always looking for something that I used to eat and can still have. When I have any leftover rice at all or leftover chicken and rice, I always heat some oil in the pan and crisp it up. It is very satisfying. Someone once told me that almost every culture in the world has some version/name for crispy rice on the bottom of the pan. Don’t know if it is true but that is what I heard. Oooh, this looks delicious. I love rice and fried eggs together. 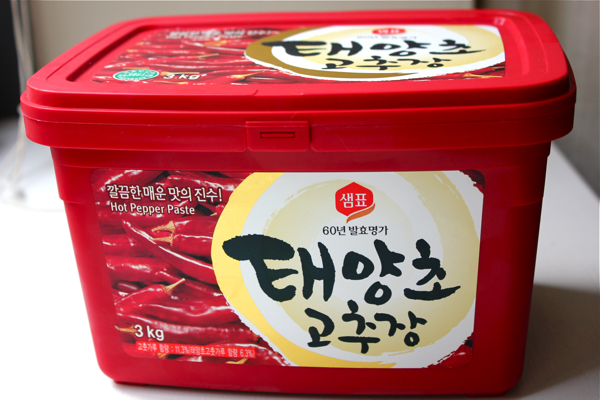 And I have some Korean chilli paste so I’ll have to turn my hand to this! Thanks for posting.